Happy 2015, readers! 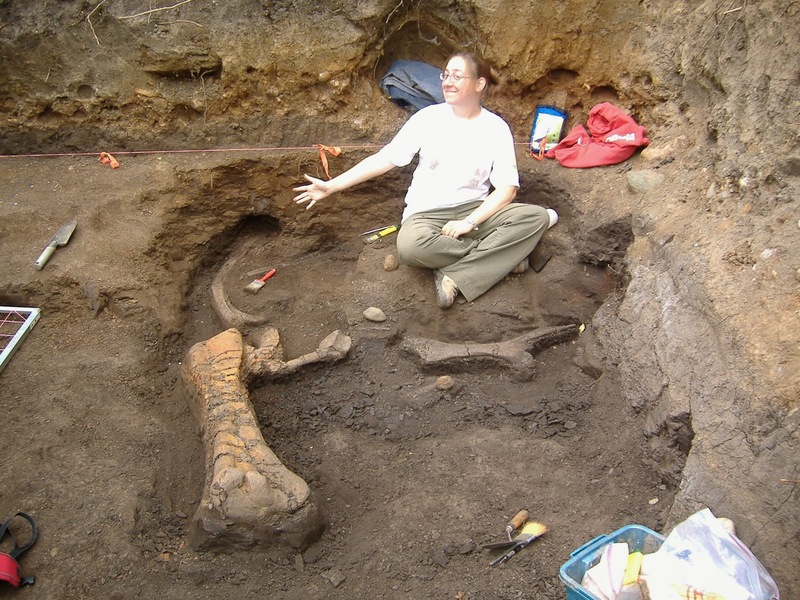 So many exciting things are happening right now – the Dino Hunt Canada website launched a few weeks ago and the documentary will air on History Channel Canada later this month, things are chugging away here in North Carolina, and the Danek Edmontosaurus Bonebed special issue of the Canadian Journal of Earth Sciences was published just before Christmas. There’s already been lots of great coverage of the special issue, but I wanted to share a few thoughts here as well. Please enjoy these very fine Edmontosaurus bones! The special issue on this bonebed came about when Mike Burns and I got to talking about how the Albertosaurus Bonebed special issue had been such a good motivation for the lab to do some collaborative projects, and given that the PALEO 400 fieldschool students needed to develop research projects on the bonebed, wouldn’t it make sense to try to polish those into publishable form as well? 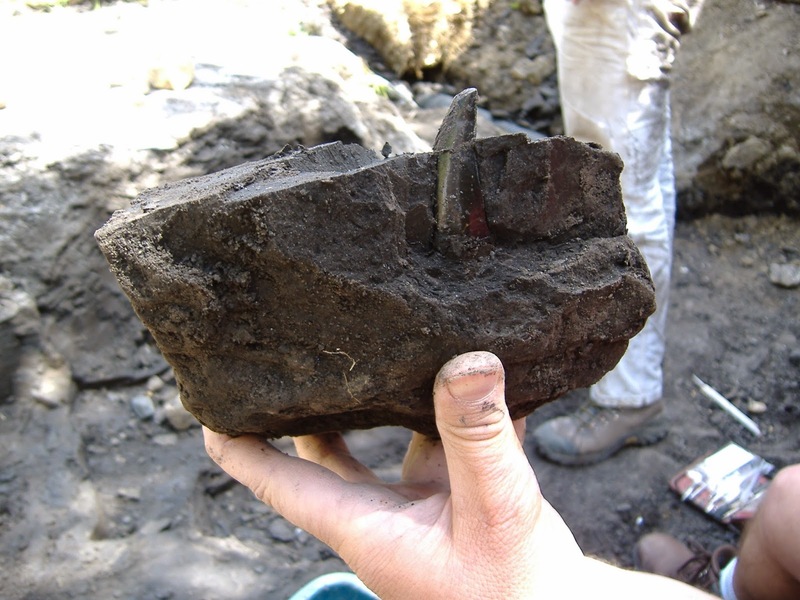 This was back in 2012, and at that point there’d been 6 years of really good fieldschool students who had come up with a variety of interesting small-scale independent research projects. We put out a call to current and former students to see if anyone would be interested in expanding their project and contributing it to the volume, and also invited some of our colleagues who were working on hadrosaurs and/or bonebeds in some way to see if they would be interested in working on the material as well. Not all of the former students contributed papers, but I was really pleased by the number who did – it’s a big job to get a paper through peer-review, and I’m really proud of all the first-time papers in this issue! It’s also been really rewarding to watch our volunteer fossil prep program grow over the years I was at the UofA – we started with a few volunteers here and there, but in recent years we’ve had as many as 8-12 people working in the lab on a weekday evening. We run two shifts of volunteers – an evening program from 5-7pm on some combination of Mondays to Thursdays, depending on the schedules of the grad students who supervise the volunteers, and a daytime program by appointment in our larger basement laboratory with the larger and more challenging projects. 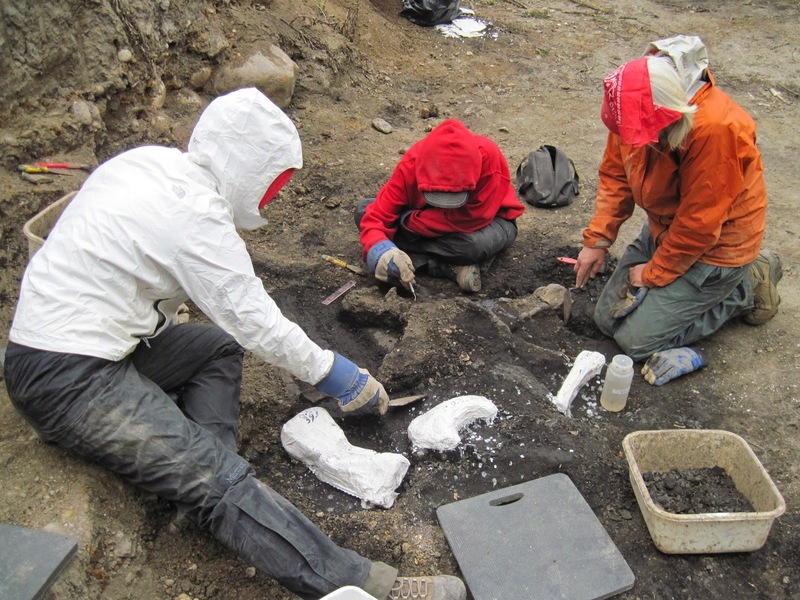 Most people start in our evening lab programs, and many of the bones prepared during those hours were from the Danek bonebed. The Danek material is amazingly good for volunteers – with a bit of soaking, the surrounding shaley matrix flakes off the relatively durable bones. We would never have gotten through all of that material so quickly without the dedicated help of a very large crew of volunteers! If you’re reading this from Edmonton and are interested in volunteering in the DinoLab, follow our Facebookpage for up-to-date contact information and hours. Ian is a shoveling machine! Although I haven’t gone out to the bonebed for the full 3 weeks each year, I’ve tried to get out at least a little bit each year, even if it’s only for ‘overburden removal’ days. It’s amazing how much dirt we’ve moved since my first year there in 2007! 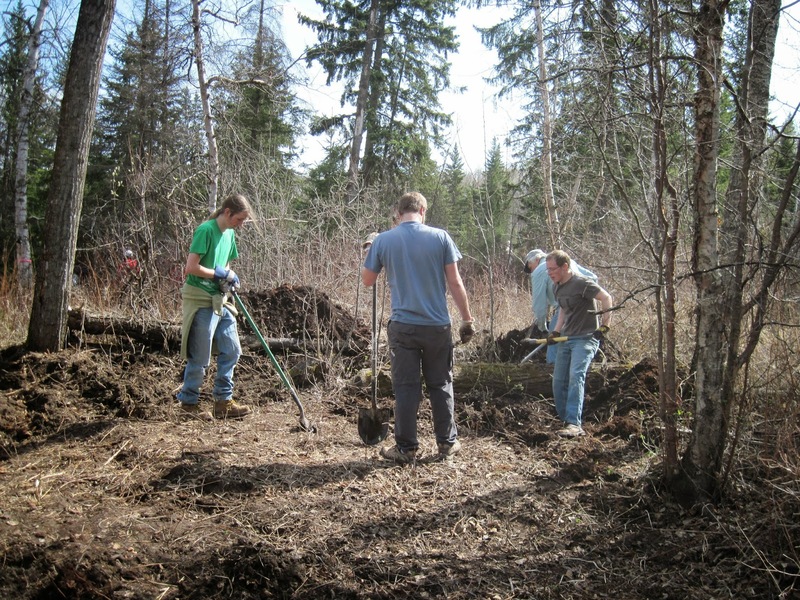 Because the bonebed is located in a nature preserve, we need to be a bit careful with how we handle the overburden – we can’t let too much sediment get into the creek, and we also can’t just cover up existing plants. What we’ve taken to doing is removing the topsoil from a ‘meadow’ nearby, evenly spreading the relatively sterile Quaternary sands/gravels in the clearing, and then ‘replanting’ the topsoil overtop and sprinkling with local plant seeds. We dig in the early spring, and by July the area is so green you’d never even know we had disturbed it. 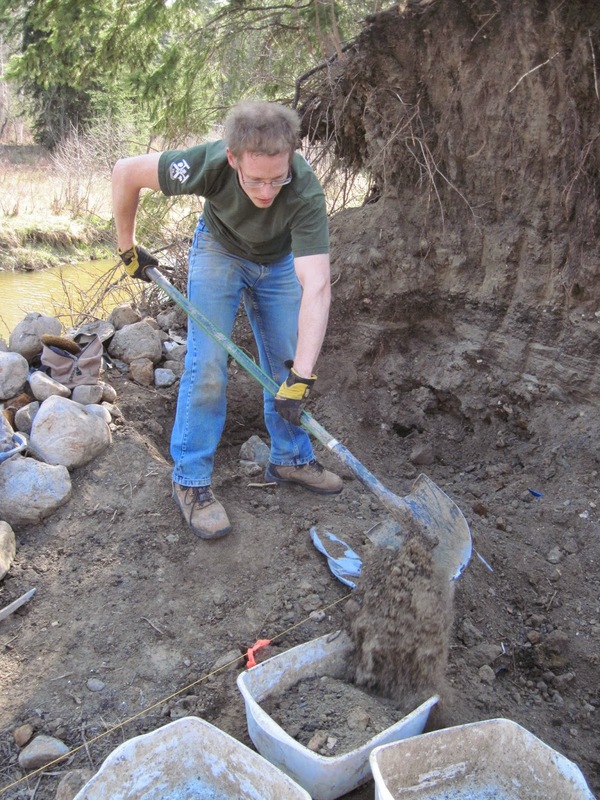 The bonebed is a beautiful place to work – we see lots of interesting wildlife because of the stream nearby, the matrix surrounding the bones is soft and incredibly easy to work with, and the bones are plentiful. Sometimes it’s cold in April in Edmonton! One of the things we mentioned in the press materials for the special volume is the presence of other dinosaur fossils throughout Edmonton and the surrounding areas. I have a hunch that if you dig pretty much anywhere in Edmonton, you’re probably going to hit a dinosaur bone at some point. There’ve been dinosaurs in the sewers and dinosaurs in the pipelines, and dinosaur bones pop up along the North Saskatchewan River with relative frequency. If you think you’ve found a dinosaur bone in Edmonton, make sure you understand the laws protecting fossils in Alberta – you need a permit to dig up fossils in Alberta, and fossils should be stored in accredited facilities like the Royal Tyrrell Museum of the University of Alberta Laboratory for Vertebrate Paleontology. But if you find something, tell the University of Alberta about it! Take a picture of what you found, and if you have the ability to mark the latitude and longitude with a GPS or your phone, do that too. You can get in touch with us via the DinoLab Facebook page. Maybe you will be the next person to stumble across a dinosaur in your city! Not in Edmonton? The Danek Bonebed is where much of the taphonomy and fieldwork lesson for Dino 101 was filmed! The 4th session of Dino 101 started today, so go have a look if you’re interested in learning more about the bonebed.